Your surprising academic casualty of the class of 2010: no one? Justin Delaine, locked and loaded. So Charles Goldberg has a report from campus on Auburn enrolling a new batch of freshmen from the football team’s class of 2010. The headline and first couple of paragraphs deal with the batch’s headliner (natch), Michael Dyer. Also arriving were defensive tackles Jeffrey Whitaker and Kenneth Carter; defensive end Justin Delain [sic]; wide receiver Trovon Reed; linebacker LaDarius Owens; athlete Ryan Smith; and punter Steven Clark. Ever since Signing Day, the “will they make it or won’t they?” qualifiication buzz has centered on two prospects: Carter and Delaine. Carter we found out last week was good to go, but the expectation here was that we’d still wind up waiting until the fall for Delaine’s status to be resolved. Uh, no. If Delaine’s on campus and taking classes, it’s been resolved right freaking now, man. 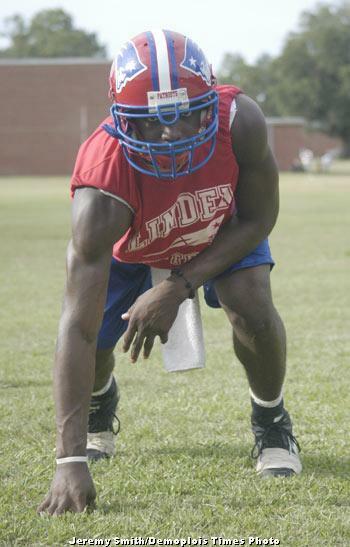 Delaine will be a member of Auburn’s football team in 2010. Which means that after signing 27 players in February, Chizik and Co. will see the NCAA strike down the immediate eligibility of … one of those players? (Jeremy Richardson, remember.) Though a surprise later this summer is still certainly possible, the general expectation is that every remaining member of the class will qualify. That is a stunning development, particularly for a program whose classes hemorrhaged recruits like few in the country under its previous regime. It’s also a huge boon for Delaine, who’s been universally pegged as an athletic freak (6-5, 225) with star potential if he can keep polishing his play. No offense to all the JUCO defensive line coaches out there, but that development’s going to happen a lot faster and a lot better with Delaine on campus and working with Tracy Rocker than elsewhere. The other juicy tidbit from the Goldberg report is that Clark is already on campus. If Auburn did enroll every other member of the class including Shon Coleman, someone would unfortunately have to be in line for a grayshirt. (And since I’m not aware of any players who expected a grayshirt up front, a la Robert Cooper in 2009, this could be a problem.) The consensus on the Auburn Interwebs has been that if it did come to a grayshirt, Clark was the most likely candidate, what with him being a punter who’s even-odds or worse to redshirt this year anyway. Yeah, you can nevermind that as well. Either Coleman’s delaying enrollment by a year (or paying his own way), or there’s a non-qualifier out there somewhere, or someone else is taking the grayshirt. Great news! It’s like coming of the probation we were never really on. I wouldn’t be surprised to see Shon Coleman wait to enroll at AU. I’m not hoping that he waits, but I think coming back from a cancer scare like he’s had (and is still fighting) is about more than just healing physically. The emotional part of the equation — something that’s as variable among cancer survivors as the individuals themselves, — is something that has to be considered. Maybe that part of it will be easy for the young Mr. Coleman. In case it’s not obvious, my reply here about Coleman doesn’t really have anything to do with football. While I’m as big an Auburn fan as any, my thoughts (being a father myself) are about Shon and his health and his family. If he is healthy, ready to leave home and tackle his start on a college education this fall, then I hope he’s on campus regardless of whether he is ready to really work with or help the team. If he were my son, I’d feel the same way. Moving past Coleman and onto the point about qualifiers, I’d agree with you that the story buried the lede. AU in a position where signing 27 means that we are potentially still over the limit of 25 this fall is a clear sign that something has changed for the better and that this staff is earning their pay. It’ll be nice to have enrolling classes that come close to matching the recruiting classes from signing day. Lord knows it seems like it’s been a while since we got almost all of ’em on campus…and those we did get seemingly too often did not stay. This Gene Chizik guy and his crew of Luper and Trooper and Malzahn and Rocker and Roof just might know what they are doing. I feel more optimistic about the fortunes of the football program at AU than I have in a long time. Heck, I feel more optimistic about most of the athletic program than I have in a long time. It’s great to be an Auburn Tiger. War Eagle! When was the last time Auburn had a full class of 25 arrive on campus? I honestly cannot recall this happening. It is great news that Delanie will qualify. He is the next of those many Lolley gems we have had at Auburn over the years. Dear lord. Please let Chizik and crew recruit well forever, because it’s gonna hurt really, really bad when this class graduates! Have we ever graduated over 20 at once before? Roman, I agree with you 100 percent regarding Coleman. I would _expect_ that he’s taking the year off to get healthy, get everything in order away from anything related to football, and then make a go of it. But whatever he and his family feels is the best thing for him is the best thing for him, quite obviously. I don’t want to speculate too much on what that might be. I just want him to get healthy. I also share your optimism for AU athletics in general, as I think the letter to Jacobs from last week probably showed. Junky, similar deal, I think this year’s senior class is over 20 but it’s a mix of 2006 redshirts and 2007 members that never took a redshirt. As for 20 members of one class moving en masse to graduation, no idea. If I recall, the Terrance Coleman non-qualification was a surprise to everyone back in 2009. Still a decent chance someone doesn’t make it. True dat, Michael. We probably shouldn’t be counting our qualifiers before they’ve done whatever it is they do instead of hatching. Rollison leaving frees up a spot, yes? spree, out of the 85 total, yes (which Auburn was already well under), but it doesn’t change the math to get from 26 (27 minus Richardson) to 25 for the class of ’10. What Rollison’s departure really means, math-wise, is that Auburn’s got another spot open in the class of ’11.